One of the most important things to know about chicken behavior is that it can vary from one chicken to another. Even with a flock all the same color and breed each will have its own personality traits. If you want to get to know your chickens and understand them check on them every day and just spend a little extra time each week watching them. Most of their behavior is perfectly natural and there is good reason for it. Understanding their behavior can help you monitor the health of your flock. Please read all the way through this article. Near the end is important information about watching for signs of illness and disease. Survival is a chicken’s ultimate goal. Anything that helps them survive is what they want and the root of chicken behavior. They are flock animals and naturally feel more at ease when in the company of several other chickens. Hunger is primary and they love to eat, so much so, they spend most of the day eating. Chickens can receive adequate nutrition from processed packaged feeds but for a truly balanced diet they need access to vegetation daily. 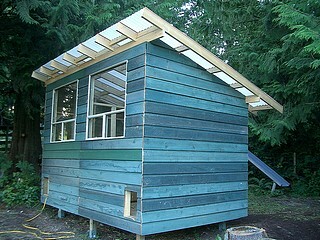 coop with adequate roosting area for the size flock. Chickens will huddle together at night for warmth in cold weather and spread out on hot or warm summer nights. Destructive chicken behavior will be observed in chickens kept in too small of an area with an unbalanced diet or shortage of feed. The flock may become aggressive toward each other, fighting over food, sometimes killing and eating each other and eggs, having weakened immune systems due to stress and poor diet, pulling each others feather out to eat them, and falling prey to each other, cold temperatures, disease and parasites. Poor quality living conditions for chickens will produce poor quality eggs and meat, chicks that cannot survive, not to mention loss of chickens, the expense of buying medications and having to replace chickens early. If you are new to chickens, the best way to get to know them is to observe their behavior without interfering. Chicken behavior can teach you many things about your flock. You may notice that some bully others, insisting on being first to the feeder or treats. You may notice, if you have any roosters, that some hens and roosters seem to have their favorite mates. Even some hens appear to be friends and equals in a flock while disliking others. The structure of a healthy flock includes this “pecking order”. More dominant chickens will actually peck at less dominant chickens in order to exert their rights to eat and drink whenever they want, plus demanding their favorite roosts for the night. Small harmless battles may be seen as they work things out among themselves. When a particular chicken looks pecked or plucked it’s time to watch, see who is doing what to whom and try to figure out why. 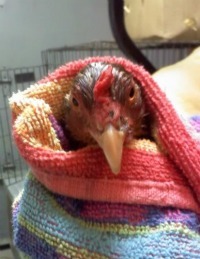 There’s no need to interfere with most chicken behavior unless there are injuries, including feather loss. The exception would be during the molt; feather loss is natural and to be expected. Usually the less dominant will walk or run away but over crowded dominant chickens will attempt to force out weaker ones which can lead to serious injuries and death especially in confined areas, towards the young, old, or small. It’s important to know that chickens are nearly, if not totally, blind at night. They know they are vulnerable and as the sun begins to set, seek a safe high place to sleep all night. predators out. When introduced to their coop and kept comfortable and secure there, chickens naturally return each evening and expect to be let out in the morning. sick chicken will often isolate itself and be picked on by curious flock members. Chickens added to an existing flock may take some time or never really bond with a flock as well as chickens raised together. Knowing what’s normal for each will help you spot early signs of trouble. Roosters may or may not become aggressive with each other. A lot depends on how many hens there are to share and how much room there is but also on the breed and temperament of each one. Dominance or aggressiveness in roosters is a normal part of chicken behavior. If you want to raise roosters for meat it’s possible to caponize (neuter) them, preventing breeding and unwanted aggressive behavior in the flock, while improving the quality of their meat as they mature. In-tact roosters can and might fight to the death or severe injury. Too many rosters in a flock can create a lot of stress for all members which can cause minor to serious health problems. Chickens are very active creatures so any signs of weakness or laziness, and not keeping up as usual are worth looking into. If you have a question you would like answered click here. one of our chickens seems to be shaking its head more than normal...any ideas? I have 1 laying hen that is sitting in a nesting box backwards, she is panting, looks distressed. no sign of illness in any other hen. New behavior: squaking all day in 14X12 dirt area; they have access to food, water and their coop door is open. We have chickens that eat really good one day and the next they are paralyzed. What is causing this? CAN I DO SOMETHING ABOUT BULLY HENS? WHAT COULD EXPLAIN THIS ODD BEHAVIOR? WHY DOES MY HEN TAKE HIGH STEPS? Why do some chickens peck your feet; it's like a greeting or something?